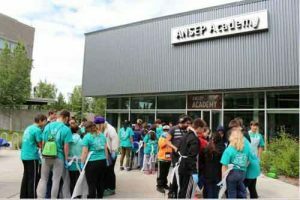 ANCHORAGE, ALASKA – This week, the Alaska Native Science & Engineering Program welcomed more than 50 middle school students to its third STEM Career Exploration component of the summer. During this five-day residential camp on the University of Alaska Anchorage campus, students explored the field of marine biology by participating in several hands-on activities led by industry professionals. STEM Career Exploration is designed to help students focus on a particular STEM field that interests them. It also gives them a chance to renew their dedication to and enthusiasm for the ANSEP community and pursuit of a degree and career in STEM. With Alaska having more coastline than the rest of the United States combined and its waters being home to an abundance of marine life, the field of marine biology is of particular importance in the state. Students who participated in the marine biology STEM Career Exploration this week took part in a variety of activities, from a sea otter necropsy to a shark dissection, all with the help of industry professional and ANSEP staff. To be eligible for STEM Career Exploration, students must have previously completed ANSEP’s Middle School Academy component and maintained grades that adhere to ANSEP’s high academic standards, including being on track to complete algebra 1 before high school. In addition to the educational benefits, STEM Career Exploration gives students a chance to continue familiarizing themselves with the UAA campus and the rigors of college life as well as interact with like-minded peers from around Alaska. “STEM Career Exploration is an important piece of ANSEP’s educational model because it not only provides students with top-notch learning opportunities alongside industry professionals but it also allows students to build on their support network of friends and mentors from ANSEP’s Middle School Academy,” said ANSEP Founder and Vice Provost Dr. Herb Ilisaurri Schroeder. The Alaska Native Science & Engineering Program, founded by Herb Ilisaurri Schroeder, Ph.D., is part of the University of Alaska system. The program strives to effect systemic change in the hiring patterns of Alaska Natives in science, technology, engineering and mathematics career fields by placing its students on a path to leadership. Beginning at the middle school level, ANSEP’s longitudinal model continues through high school and into undergraduate, graduate and doctorate programs, allowing students to succeed at rates far exceeding national numbers. In 2015, the organization launched ANSEP STEM Teacher to further remedy Alaska’s rural education issues by supporting students pursuing STEM-related teaching certificates. ANSEP plans to place one ANSEP STEM Teacher in every Alaska village by 2025.